Pop Quiz. What Else Does This Patient Have? I recently had a patient who had one of the most extensive list of drug allergies I'd ever seen. It filled up nearly two screens worth of data on our electronic medical record. While looking through it, I spied the usual suspects. Of course narcotics are on the list. Doesn't everybody say that morphine or codeine makes them nauseated or cause altered mental status? Then of course there is lidocaine because most people have had dentists who told them that lidocaine causes their heart rates to accelerate when it was probably the epinephrine mixed in the lidocaine that did that. Can't forget about the latex allergy because if you're in the hospital often enough, somebody is bound to claim that rash on your skin was caused by a latex glove. After perusing the list, I had little doubt about what I would find in the patient's medical history. Of course I was right--fibromyalgia was listed in her H+P. I'm not the only who has noticed an association with fibromyalgia and extensive drug allergies. These patients are difficult to treat perioperatively, mainly because their symptoms are so elusive. There is nonspecific body aches, GI symptoms, and psychological issues. Many are on chronic pain meds to control their disease. Because of their vagueness, doctors have a hard time coming to terms with fibromyalgia. It doesn't fit neatly into any of our well defined physiologic or infectious causes of disease. What kind of disease has listed treatments that include, "Deal with negative thoughts" or "Seek out enjoyable activities". That sounds like a mantra repeated at some luxury spa in Palm Springs. It's hard for us to take this seriously. But they are out there. There are millions of people in America diagnosed with fibromyalgia which means you'll most likely be treating one sooner rather than later. In fact you may even have to fill out their application for a handicapped parking permit despite your misgivings about the legitimacy of their illness. So put on your best Marcus Welby bedside manner when a patient like this arrives at your office. You'll be glad you have your Pain Medicine doctor on speed dial as you prepare to kick the world's longest punt. Remember during the healthcare debates a couple of years ago when President Obama promised that if his Obamacare reforms were to pass we could all still have the same doctors and insurance as we do now? Well as it turns out that is just a bunch of baloney. But anybody who has a middle school education could probably have figured it out. The excuse that having more young healthy people buy health insurance, which is the basis of the PPACA's individual mandate to purchase insurance, would broaden the risk pool and lower the monthly premiums has turned out to be more empty promises made by empty suit politicians. As we get closer to the full implementation of Obamacare in 2014, the states' governors are finding out that health insurance premiums are rising rapidly, at several times the rate of inflation. They're now noticing that clauses inserted into the statute to encourage its passage has adversely caused premiums to skyrocket. Stipulations like nobody can be turned down for health insurance regardless of medical condition. Obviously this encourages people from buying any insurance at all until they are actually sick. Then by all means rush off the insurance application form when you finally need it since the government has told them you can't be turned away. Or how about young adults who can stay on their parents' insurance until the age of 26. Hello. You're 26 years old! You should have the lowest insurance payments of any demographic. Have some pride--buy your own freaking health insurance. Do you still need to piggyback on your poor parents' insurance after they've paid for all your upbringing and college bills? The insurance isn't free; your parents are paying it instead of you. Stop sponging off your parents for once in your life and act like a grownup. Then there is the mandate that insurance for the middle aged can cost no more than three times that of the young. In the past this ratio could be five or greater. Naturally the insurance companies are not going to lower premiums on the older people. They'll just increase it on the young to get in line with the three to one ratio. Did nobody figure this out during the debates? I personally have seen my premiums explode in the last few years. Since I am considered an individual contractor, I pay for my own health insurance. I don't have the luxury of having a large pool of fellow employees to spread the cost. In the past twelve months, my premiums have increased 26%. Compared to two years ago, my insurance payments have gone up 40%. In the meantime I've gotten a pittance back from my insurance company because of one of the so called benefits of Obamacare, that these companies must spend at least eighty percent of the premiums they collect on healthcare. The government insists that insurance payments will be lower for most Americans. That is because the feds will provide subsidies to families of four making up to $92,000 per year. Unfortunately I am not among those who are in line to get free money from the government. And I imagine most people who have two middle class wage earners in the family will price themselves out of the subsidies too. This is all part of the giant wealth transfer that is occurring in this country. The majority of the people vote to keep their taxes low and government handouts high while raising the taxes of the minority who earn, that's right EARN, their hard earned dollars that they are so envious of. I imagine that in a couple of years my family's health insurance will become so expensive that I too will have to rely on the fed's insurance exchange to afford one. Then I too will become wholly dependent on my government for what used to be a freely capitalist marketplace. The government's tight clutch on us all appears inevitable. The medical profession is in a constant nagging mode to get people to exercise more. We rattle off the statistics about longer lifespans and better self esteem in people who exercise regularly in a quixotic attempt to get people off their butts. 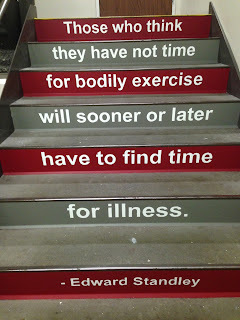 So in that spirit of exertional encouragement our hospital has decided to paint motivational sayings into the only place on the premises where people can routinely get their daily exercise, the emergency stairwell. 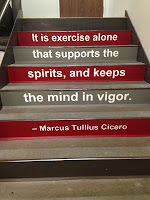 As you can see from these pithy quotations, they all extoll the virtues of a vigorous body, which in theory should lead to an equally vigorous and astute mind. 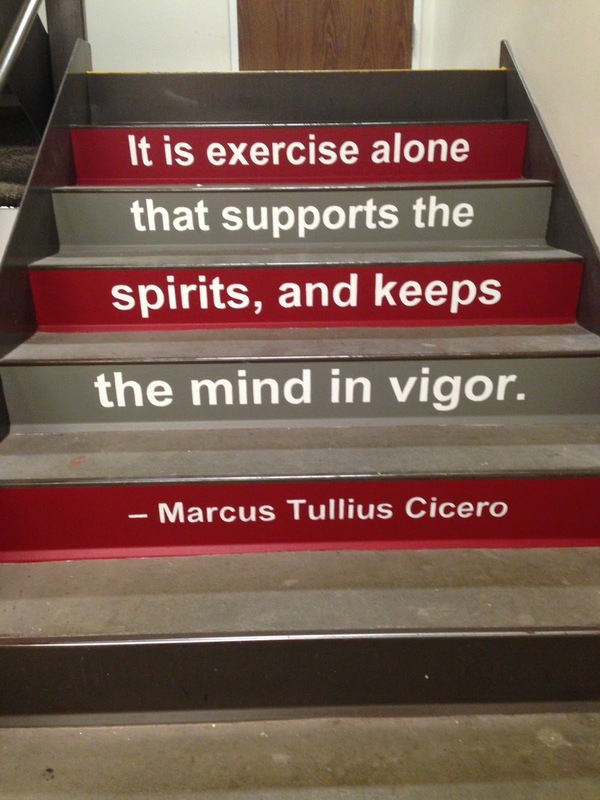 You would think that daily words of encouragement would get more people to exercise and climb the stairs, right? Unfortunately, the hospital's HR Department has its heart in the right place but the execution has failed miserably. 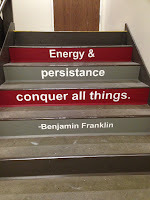 It's pretty obvious the fatal flaw in logic when somebody approved the laborious task of stenciling in these sayings against the front of the stairs. The people who need to exercise the most are not the ones who walk the steps every day. They are the people least likely to see these inspirational words. I personally try to take the stairs when I don't have to go higher than three floors but I know some people who have offices on the top floor who climb all the way to the top every day. We don't need any extra support to get ourselves to exercise. Unfortunately there are people who will wait for an elevator for five minutes just because they don't want to walk up even one flight of stairs. These are the employees who usually have a little too much junk in the trunk but can't or won't put in the effort to walk up the stairs. I look at them and wonder why they don't bother to just walk a little further to the stairwell, which in our facility is right next to the elevators and get a little blood pumping. If they do that every workday for a year they could burn off thousands of calories. The worst offenders are the people who will wait for an elevator so they can go DOWN one flight of stairs. That just annoys the heck out of me. So if your hospital is trying to get its employees to exercise more, by all means encourage them to take the stairs. 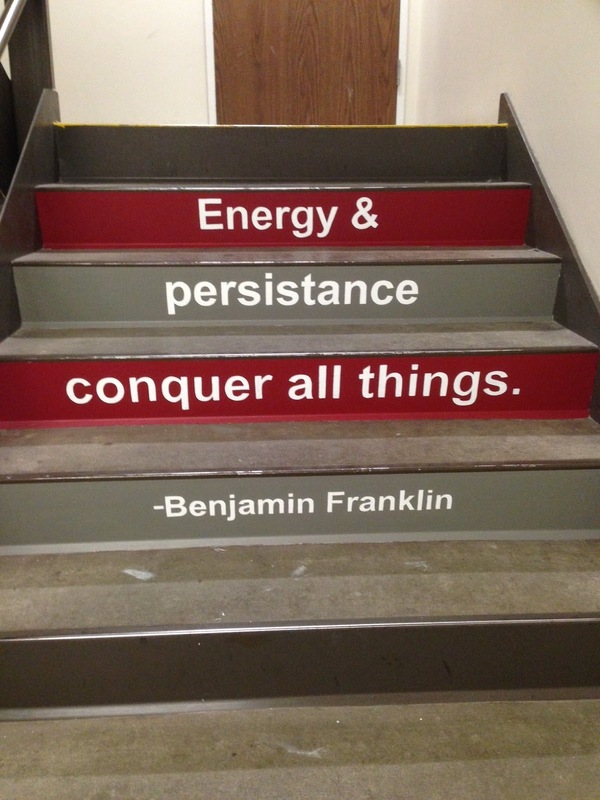 Just try to put the motivational speeches OUTSIDE the stairs where it will do the most good, not inside. Have you ever wondered how much money doctors make? Of course you have. Let's say you're a college kid going through premed courses and you're wondering if you've made the right career decision when you hear so much moaning and groaning from doctors about how tough their lives are. You want to know if all these courses on organic chemistry and anatomy are worth the trouble, expenses, and sleepless nights. Or suppose you're a medical student and you're thinking about which specialty makes the most money. Admit it, you do think about such things. Don't lie to yourself and say you never thought about money when you chose medicine as a career. There are all sorts of websites out there to help you figure out physician salaries. Now somebody has nicely brought together the various career surveys available to give a compendium of how much money we make. It probably wouldn't surprise anybody that neurosurgeons earned the most, with an average starting salary of $669,000. It also wouldn't astonish anybody who has been paying attention that primary care fields made the least, with psychiatrists bringing up the rear with a median salary of $217,000. Anesthesiologists fair pretty well. While we are not the best paid, we are also far from the bottom with a median salary of $377,000. Depending on which survey was used, some of the data are not available for all the specialties, such as female/male compensation ratio, usually around 80-90%, and hourly rates. But if you're a college or medical student and you look through this list, I'd bet you're thinking, "What are those mother f***ers complaing about?" There is one qualification of being an effective anesthesiologist that is rarely discussed. It has nothing to do with how high your board scores were or whether you can recite Miller's Anesthesia cover to cover. It's not even listed in my 8 Simple Rules. No, one of the qualities of a capable anesthesiologist is how flexible he is. Seriously, we need to be pretty pliable to do our jobs. My workspace behind the ether screen can be incredibly tight, sometimes barely wide enough to put a sitting stool in. Some spaces are so small that I can't open my anesthesia cart drawers without standing off to one side. I remember one operating room we had where there was just enough space for the operating table and patient gurney to sit side by side. Everything else had to be shoved as far into the corners of the room as possible. I couldn't even sit down for a case. Squeezing through a room like that made me feel like Indiana Jones trying to slither through an ancient labyrinth. Eventually that room was converted into an equipment closet, which was really what all that room could accommodate. Because of patient positioning on the OR table I sometimes have to bend into extremely awkward angles to access the patient. I can't tell you how many times I've had to get down on my knees and duck my head under the drapes to check for train of fours or place an NG tube. When a trauma patient comes in, the surgical drapes are usually in place before I've had a chance to put in all my lines. Therefore it is a struggle to try to place an arterial line and a central line while working under the drapes and trying to maintain sterility of the field. My work space is barely a few square inches as I stoop deeply while I try to shove the drapes off the patient with my elbow and attempt to get that cordis into the internal jugular vein. All the while the surgeon is yelling, "Anesthesia, what's going on down there!" It is back breaking work. Not surprisingly, most anesthesiologists I know are fairly slim. One cannot take up too much physical space in this job. Eventually it does take a toll as many of our older partners complain about back and knee pain. That's the price you pay for having one of the best jobs in America. An abstract was presented at the 2012 Postgraduate Assembly in Anesthesiology that measured the effects of giving lidocaine and propofol separately versus mixing the two in one syringe to lessen the pain most patients feel with injecting the drug. Presented by a group from the Robert Wood Johnson University Hospital, the study found that injecting lidocaine first before propofol was not as effective as mixing 60 mg of lidocaine into a syringe with 200 mg propofol. In fact, the mixture resulted in pain that was half of that experienced by the separate injections group. The researchers theorized that the lidocaine may act as a stabilizer of the kinin cascade, resulting in less pain. Another possibility is that the lidocaine decreased the pH of the propofol, causing less burning. I had previously written about this scourge of an otherwise wondrous drug. I still believe that it is the rate of injection of the propofol that determines the severity of the pain. When I push 30 mg of lidocaine followed by 30 mg of propofol then wait about 30 seconds before giving more, almost all patients feel no pain. After that I continue to give small boluses every few seconds until the patient falls asleep. Usually by then the patient has already become amnestic and giving a bigger bolus for a faster induction will not be remembered by the patient at that point. Again, if you're trying to achieve a rapid sequence induction, to hell with the patient feeling pain. You're trying to save his life, and that takes precedence over any coddling of the patient's feelings about the propofol burn. 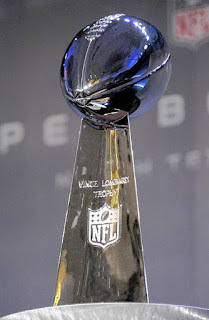 Why Are There No Surgical Emergencies During The Superbowl? This pattern never ceases to amaze me. Whenever there is a major sporting event or a holiday, bookings to the operating room just disappear. I was on call this past weekend and the number of emergency surgeries was practically nil. The only thing I can attribute this to is that Superbowl weekend was in full swing. The OR was packed the weekend before. And today it looks like the schedule is stuffed to the gills with all the cases that conveniently didn't get done yesterday. It's not just the Superbowl either. During March Madness and the Final Four of the NCAA basketball tournament, the operating rooms are also underutilized. Other major sporting events where the surgeons mysteriously can't find any cases to work on include the NBA finals, if the Lakers are involved, or the World Series, if the Dodgers are in it. Major family holidays like Thanksgiving and Christmas also result in few surgeries being booked. It makes me wonder how legitimate some of these so called "emergent" operations really need to be done on a non holiday day. You would think that a certain number of emergency cases will need to be performed regardless of the occasion. What happened to all the open reduction of hip fractures that are normally scheduled for 8:00 PM on a Saturday night? Just because it's the Superbowl people suddenly increase their bone density and don't break their bones as easily? Can the Superbowl miraculously prevent people from developing acute appendicitis? How else to explain the lack of appendectomies that normally clog the OR schedule. Maybe the NFL could somehow patent this wonderful elixir that is the Superbowl and sell it as a health aid. It will save the country billions of dollars in health care costs. I'll take a cut of that for my money saving idea. Sent to my offshore account, of course. This is the dirty little secret amongst anesthesiologists. While the entire nation is trying to streamline medicine and make it more cost effective and efficient, it is against the self interest of anesthesiologists to follow suit. The reason for this has to do with the way anesthesiologists are paid. Anesthesia billing is unique compared to other fields of medicine. Surgeons and internists are paid based on the patient's diagnosis and procedure performed. For example a surgeon will get paid a set amount of money for performing a hernia repair or a lap chole. A cardiologist will be reimbursed a certain sum for treating an acute MI. And that's it, other than a few modifiers thrown in. By contrast, anesthesiologists are paid based on procedure performed PLUS time spent with the patient. Every surgical procedure has an associated CPT code for insurance purposes. This CPT code is then converted into base units which is determined by Medicare and insurance carriers. The more complex the case, the higher the base units assigned. The number of base units is then multiplied by a conversion factor, which is in dollars, to determine how much money the anesthesiologist will get paid for that procedure. This conversion factor changes with geographic location, based on cost of living and the preponderant cost of providing that service in the area. But that's not all. Anesthesiologists also get time units for the procedure. These are usually marked in 15 minute increments and start when the patient enters the operating room. Therefore a procedure that lasts one hour will get four units of time. If it goes to one hour and two minutes, the anesthesiologist can bill for five units of time. So when an anesthesiologist bills for a case, the formula is (base units + time units) x conversion factor=$$$. Pretty sweet deal right? While a surgeon may spend three hours on a difficult hernia repair and still get the same amount of money as a twenty minute repair, to the anesthesiologist it's just more money in the bank. Cha Ching! Unfortunately this set up is also ripe for abuse. While it is difficult and fraudulent to change the diagnosis to get a higher base unit, the time unit reported can be slippery. It is all too easy to extend the time units to increase your reimbursement. And it is all legitimate too. I know some anesthesiologists who have perfected this practice to a science. For instance, just because a patient enters the OR doesn't mean you have to start the anesthesia right away. Maybe you decide you don't draw up your drugs until the patient enters the room. This can easily add another ten to fifteen minutes to your time units. I'm shocked when nurses tell me about colleagues who take over twenty minutes to put a patient to sleep after entering the room. I can't imagine what they could possibly be doing for that long. I'm sure it is nerve racking for the already anxious patient too. Emergence is even easier to add to your time units. It's very simple to say the patient just isn't ready to be awakened yet and nobody will doubt you. The anesthesiologist can say the patient doesn't have all his twitches back yet. Or the patient is just one of those people who takes more time to metabolize their anesthesia and thus slow to wake up. So while the nurses and surgeon are sitting around twiddling their thumbs waiting for the patient to regain consciousness, the anesthesiologist is sitting back and fattening his wallet. I personally detest wasting time in the operating room. I have things to do and family to tend to when my cases are done for the day. But maybe some people just need to make more money for their Porsche payments, or their Caribbean cruise vacation coming up. Whatever the reason, the anesthesia time units will be difficult to eliminate as so many of us have come to finesse the system for our own personal gain. I'm coming across some great anesthesia blogs recently. Yesterday I mention Kate O'Reilly's Kate Vs. World blog. Now I've stumbled on a delightful blog called Anesthesia Goes to Hollywood. This one is written by an anesthesiologist in Dallas, TX. He doesn't have a screen name. He only signs his comments as "admin". The modus operandi of this blog is to point out all the ridiculous mistakes that Hollywood makes when it portrays anesthesia practitioners on the screen. The examples are too numerous to mention. This site is genius for a couple of reasons. First of all I'm surprised he was able to obtain the "hollywoodanesthesia" domain. I would have thought that some anesthesia group out here in Los Angeles would have gotten it by now. Then of course there is the endless source material he has at his disposal. The blog will practically write itself with all the gross errors that Hollywood makes in the name of dramatic license. From all the medical goofs on "M*A*S*H" to the silliness of the eerily similar OR scenes in "Independence Day" and "Spiderman 2", the writer shouldn't ever have to worry about getting a writer's block. I'm just amazed how much time he has to watch TV. I rarely watch it anymore, due to work and family obligations. But Dr. AGTH is able sit and dissect the minutia of each scene in "Grey's Anatomy" (his personal favorite), "Doogie Howser", and several other TV shows. I personally never watch medical dramas like those or "ER". The obvious errors in medical judgement makes me cringe and takes me out of the shows' fantasy environments. Therefore I get no pleasure watching TV or movies with medical themes. For example I'll always remember when I was in anesthesia residency and watched "Grand Canyon" on TV. To me it wasn't a very good movie. But the scene where Steve Martin's character needed emergency surgery after getting shot in the leg and the camera showed him breathing spontaneously through just a freaking face mask during the operation pretty much ruined it for me completely. I've never been able to watch that film again. Do you ever feel like a sucker for not obtaining a handicap parking permit? I know I do when I see otherwise healthy people park in the handicap parking spot and walk away from their vehicles with nary a sign of disability. In Los Angeles people with the handicap placard on their cars can park their cars for free at the meters downtown. As a result, hundreds of cars bear the signs from their rearview mirrors, hogging up all the parking spaces. This is costing the city millions of dollars in lost revenue. But this abuse doesn't just happen in downtown L.A.; it happens everywhere. It is so prevalent that I feel like an idiot for not finding myself a doctor that can grant me one of these coveted signs. I was at the mall the other day and I saw a luxury Lexus SUV pull into the disabled parking spot, blue tag clearly hanging from its mirror. When it stopped, out popped four happy looking people, all in their 40's or less, walking effortlessly inside. Steaming, I continued my fruitless search circling the lot for a parking space. 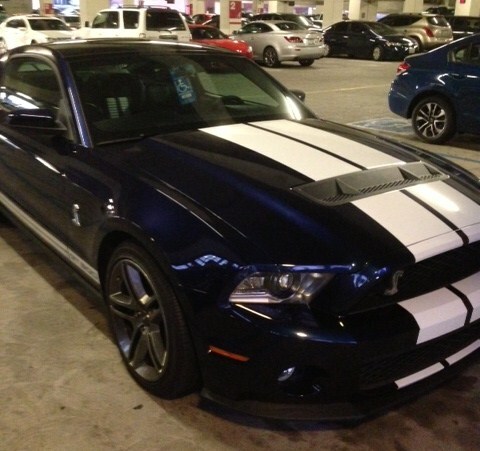 At the hospital I recently saw this magnificent sports car parked in the handicap spot in the employee parking lot. It is a Shelby GT500. This badass has up to 650 horsepower, depending on model year. I thought, "Whoa!" First the car was gorgeous. Second, why would somebody with a disability need to drive a car that can go 200 miles per hour? Now I'm not saying disabled people can't have nice cars. It's just that I have trouble picturing somebody with a history of a stroke or severe congestive heart failure needing a vehicle with this much power. But you may retort, "Dr. Z, not all people who have handicaps display their disability openly." Therein lies the problem. How do you define disability? We all recognize that a person who suffered a stroke and needs a wheelchair to get around has a disability. But does a person with severe chronic fatigue deserve a handicap parking space? How about somebody with restless leg syndrome? They have trouble with their motor movements. They must be able to park close to their destination therefore they should get a handicap placard too, right? A few years ago, one of our neighbors was diagnosed with lung cancer. Normally I would agree that somebody getting treated for cancer deserves the placard. Years after his treatment was over, he never went back to work. He never relinquished that treasured sign either. He continued collecting the state and Social Security disability payments. Meanwhile I watched him enviously every day as he stayed at home working on his motor boat and spent time with his three sons, taking them out on weekends to the lake. It's not like he was on oxygen or had any evidence of respiratory distress. He was just one happy looking dad who had the luxury of spending all of his time at home with his family and toys. Should he still be considered handicapped? What would be a believable disability that afflicts anesthesiologists that I could get? Back pain? Yeah we have lots of anesthesiologists around here who complain of that? Anxiety? Plenty of that too. Maybe I'll settle for recovering drug addict. Most people wouldn't bat an eye if I said I'm a recovering addict. That's already widely perceived by the public already. Then I'll get a disability placard so I can park by the front door, not giving a damn what other people think as I saunter in while they keep circling the parking lot.